On your mark get set go. We time the fastest popcorn machines for the Popcorn Olympics. You can watch the videos to find out the fastest time on a popcorn kettle. 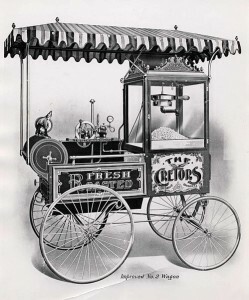 Charles Cretors in 1885 invented the very first popcorn machine to pop corn in oil. The C. Cretors and company was formed in Chicago and still exists on California Avenue on the north-side of Chicago. HTmarket.com has toured their factory and they have on display many of the first popcorn makers. 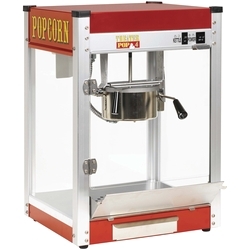 We sell on our web site some of the popular Cretors machines which are still considered by many people including myself to be the best popcorn poppers ever made. They are made to last with top grade finishes. 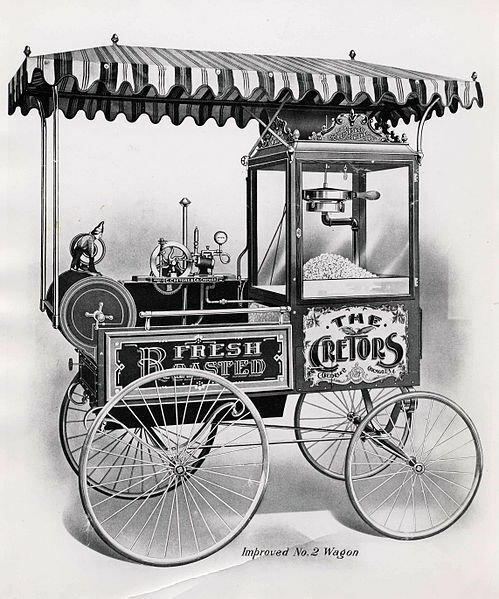 We consider Charles Cretors to be the founding father of popcorn. One of the first designs by Cretors shown below, very cool indeed. A current machine by Cretors shown below and available on HTmarket.com called the Goldrush Fresh Popcorn Popper, very cool you can bring this one home. The first vintage popper would not fit through the door. Today there are many new manufacturers that make popcorn makers some like Gold Medal and Paragon. Cretors and Paragon still make their poppers here in the USA. We like the fact that they manufacturer these machines in our great country. There are many new imported models on the market under names like Waring and Benchmark. On HTmarket.com we sell only the best made machines and we don’t sell the kitchen appliance hot air poppers. We only sell poppers with popcorn kettles that allow you to mix oil, popcorn and seasoning just like the movie theater. This process makes the freshest popcorn. If your buying for your home theater, gameroom or for just home use. You would start by looking at HTmarket.com’s 4oz popcorn machines these are the leading ones for home use. 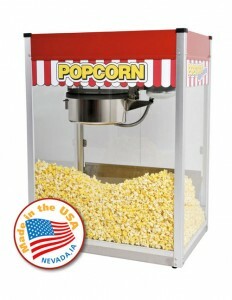 If you entertain many people at home or have a large family you could step up to a 6oz popcorn machine. In general, you can purchase for small output homes or offices 4oz, 6oz or 8oz machines. For commercial uses like banks and bars. I would start looking at 8oz popcorn machines all the way up to 16oz popcorn makers. The “oz” size refers to size of kettle and the amount of uncooked popcorn kernels that can fit into make one cycle or batch of popcorn. Shown above is Paragon’s Theater Popcorn Popper available in 4oz, 6oz, 8oz or 12oz sizes made in the USA. For higher output areas like concession stands or schools we suggest commercial popcorn machines that start at 12oz kettles. Shown below is Paragon’s Classic 14oz Popcorn Machine. Price is an affordable $789.99. Made in the USA. Ok you have chosen a popcorn popper that fits your needs the next decision point is what popcorn should I choose. 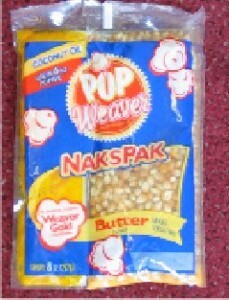 For the highest yield popcorn we suggest the Weaver Popcorn which is the best known brand. If you’re on a budget the we have other popcorn with excellent taste but not quite the price tag of weaver brand popcorn. You can check out our Popcorn for Popcorn Machines at this link. Moving on, you will want to check out popcorn supplies like scoops, popcorn butter and popcorn tubs and boxes. The size you choose is dictated by your serving requirements. We feature movie theater popcorn tubs, popcorn bags and popcorn scoop boxes. Last but not least don’t forget the butter. 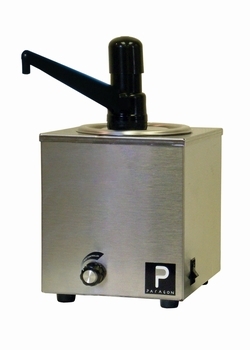 If you like movie popcorn you will probably want the butter we feature a real cool butter dispenser by Paragon and it’s affordable for home use. Ok now you got your butter dispenser in hand. You will need to get the popcorn butter. HTmarket.com offers many different brands of butter. The most popular is Odell’s and Super Kist both are used by big movie theater chains. You can buy in small portions like the Odell’s 10oz Tub or Super Kist Butter Flavor in a 6 Gallon Case. We offer a variety of sizes on our web site. In conclusion, movie theater style popcorn and the machines that make it are very affordable for every day use in the home or the office. You can give us a call or visit our web site HTmarket.com for more information.